Having managed to eat through most of the restaurants in Sydney that had been recommended by my trusted sources, I thought it was finally time in November 2013 to pay a visit to one of those elite restaurants which had continuously received praises from critics, a restaurant that, at least until recently, belonged to the exclusive club of three hats. Unlike many restaurants that had shot to fame very quickly, Mark Best’s highly acclaimed Marque had progressively gone up the ladder and retained their three hats for ten years until September 2013 when they were demoted to two. 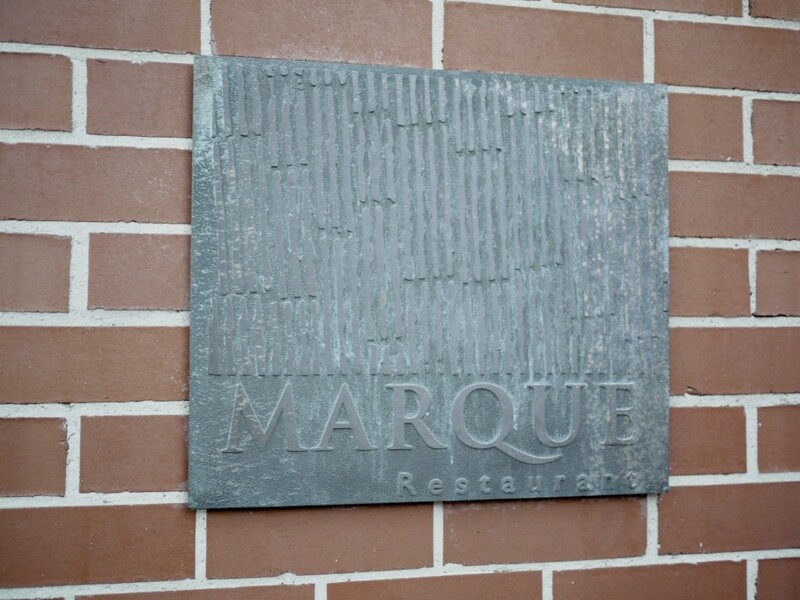 Despite the news, I expected Marque to be good or at least unique, particularly when Best portrayed himself as a man with “eternal dissatisfaction” and had been labelled as the leader in contemporary cuisine in Australia. Armed with many other accolades including a listing in S. Pellegrino’s Top 100 List, I convinced myself that nothing could go wrong. 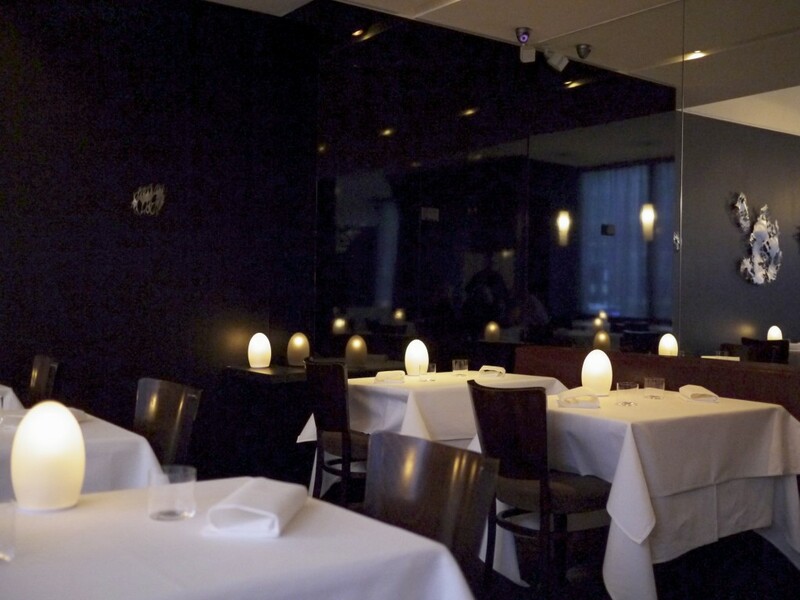 The dining room dominated by matte and glossy black walls was surprisingly peaceful despite the high volume of traffic outside the restaurant. The lack of ambience perhaps was not helped by the fact that only a third of the tables were occupied all night but I guess it was early in the week. Having just finished from a week long stint at Margaret River, Best was visible in the background that evening though his very casual attire suggested he was not overly involved in the kitchen on that occasion. After all, he did look exhausted. As tempting as it was as I glanced over the wine menu, I decided to refrain from consuming too much alcohol that evening and focus on the food. It wasn’t long before the amuse bouche of the Sea Biscuit which consisted of local Sydney rock oysters from Camden Haven and sea urchin arrived, and we were off. I loved the intense taste of the ocean. It was as if I had been dunked in the sea itself, but I confess I did not pick up much flavour of the sea urchin. What a shame. Our first dish of the evening was their signature dish, one that has been on the menu for at least ten years. However, the Fraser Island Spanner crab with almond gazpacho, almond jelly, sweet corn and avruga not only failed to impress me but also raised some concerns. 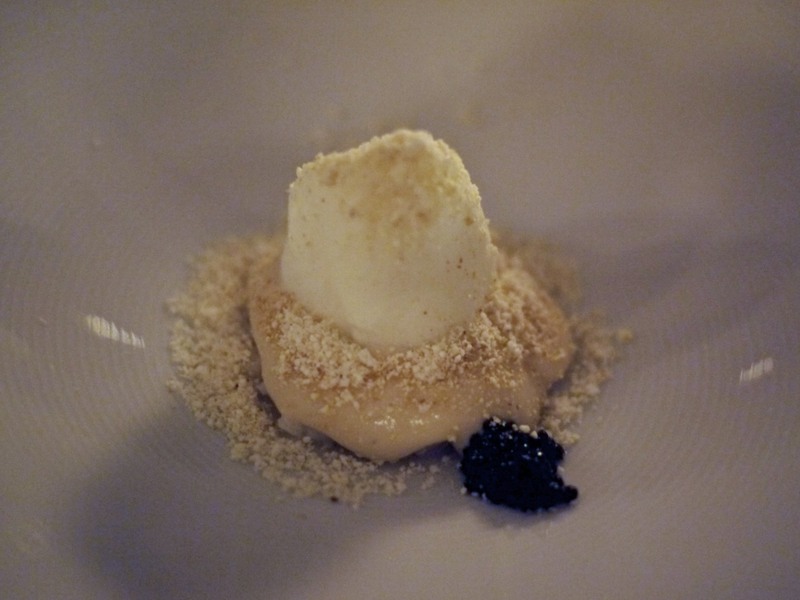 Granted, the dish was very delicate with a meringue-like texture, but I could hardly pick up the flavour of the delicate crab and even the rich caviar was absent in light of the sweet popcorn powder. 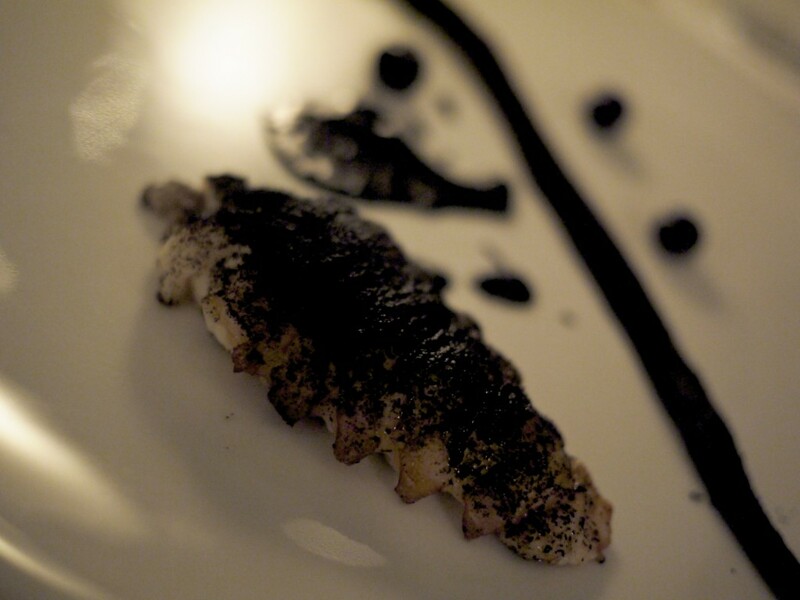 The notion of keeping a dish on a menu for ten years must surely be a juxtaposition to Bests eternal dissatisfaction? A much better dish was the Smoked eel with parmesan gnocchi & pumpkin with some star anise and orange zest. 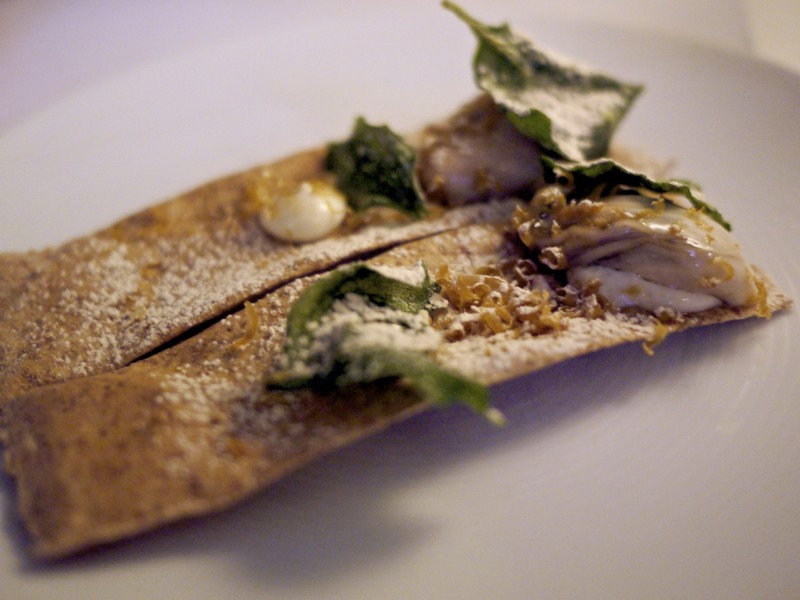 I was surprised with how much flavour and smokiness you got from the wafer thin eel. I was however not overly keen on the forced marriage of the cheese from the gnocchi and the eel. 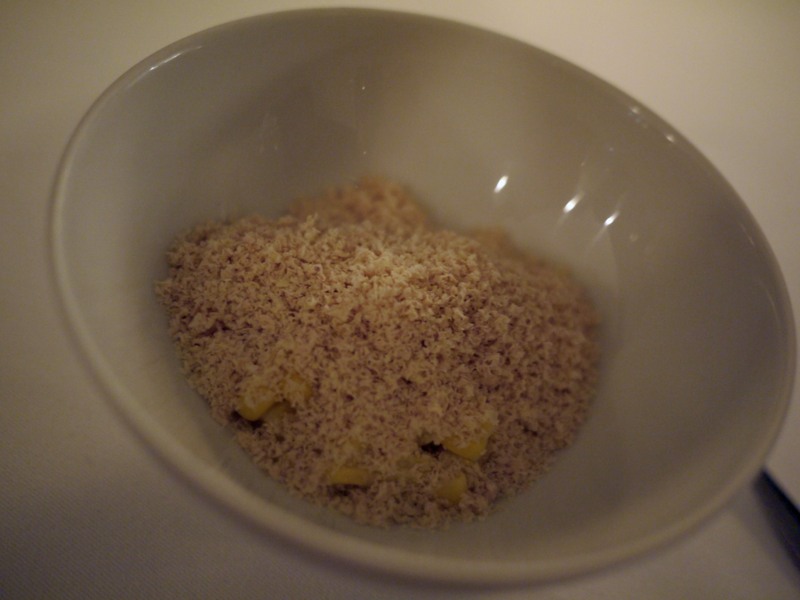 A surprise course of the Foie gras and Corn. This was my favourite dish of the night so I was glad it came. The kernels had been fermented in salt and subsequently roasted before leaving them in water overnight. 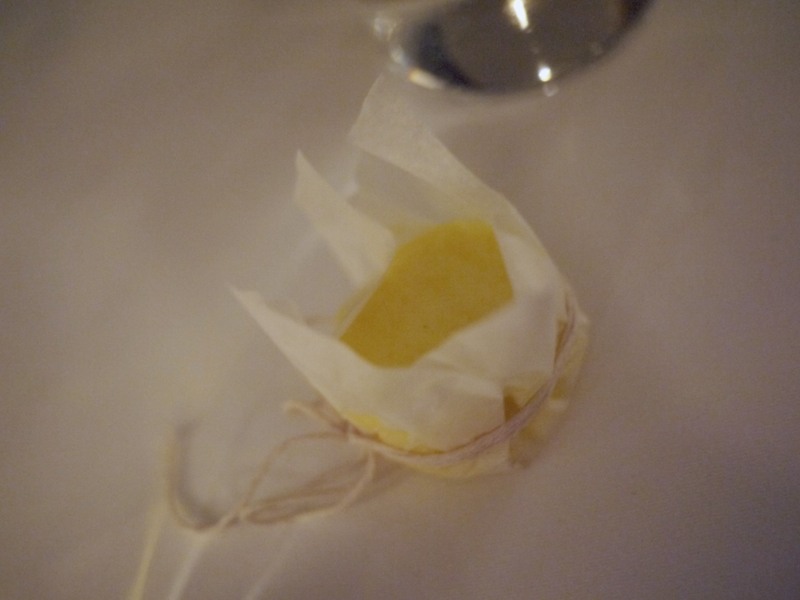 It had an interesting texture, contrast in temperature of the cold foie gras powder to the corn, and I liked the bitter – sweet contrast in flavours. 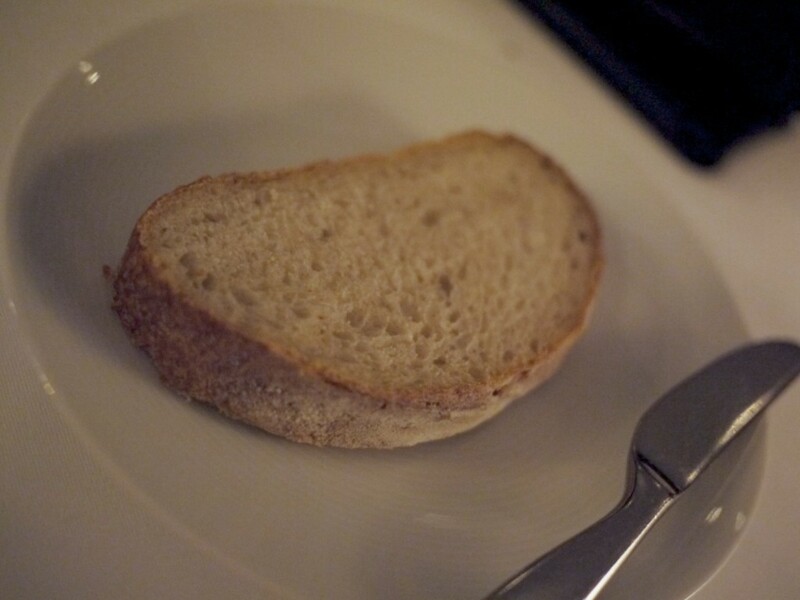 … and also make their bread in the restaurant including this sourdough. It wasn’t bad but certainly not on par with Brae. Quite bizarrely we had a meat course before the fish. Darling Downs wagyu with fermented mushrooms and ice plant. 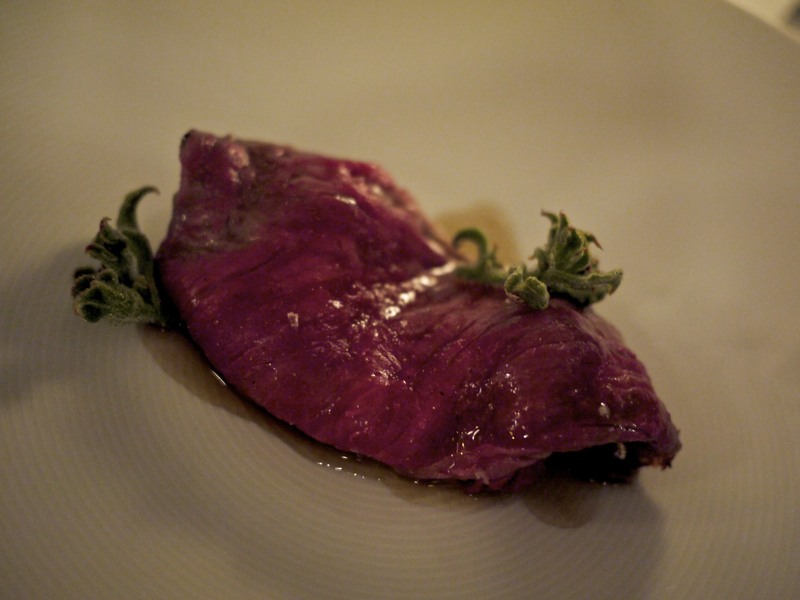 A 9+ graded wagyu from the Rangers Valley (near Tamworth) dressed in champignon sauce that had been cooked overnight. Just like the vast numbers of wagyu dishes I’ve had to date, this one wasn’t in any way shape or form memorable, although granted it was cooked well. An odd time to present the seafood course but nevertheless we proceeded with the Moreton Bay Bug with candlelight radish & fermented blueberries. The bug was sourced locally from Coffs Harbour and handled well – moist and not rubbery at all, and the mayonnaise, made using the shell, further enhanced the flavours of this Australian arthropod. The coating itself consisted of miso and leek ash. I thought the bitter radish however did not belong on the dish with the sweet crustacean. A good but incomplete dish. 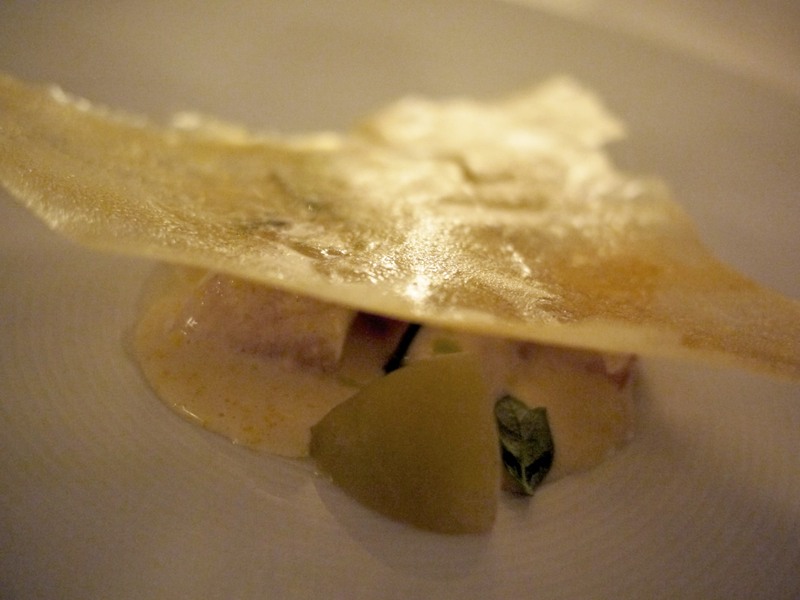 NZ Bass Grouper with green tomato, verjus, potato paper, fish milk & roe. 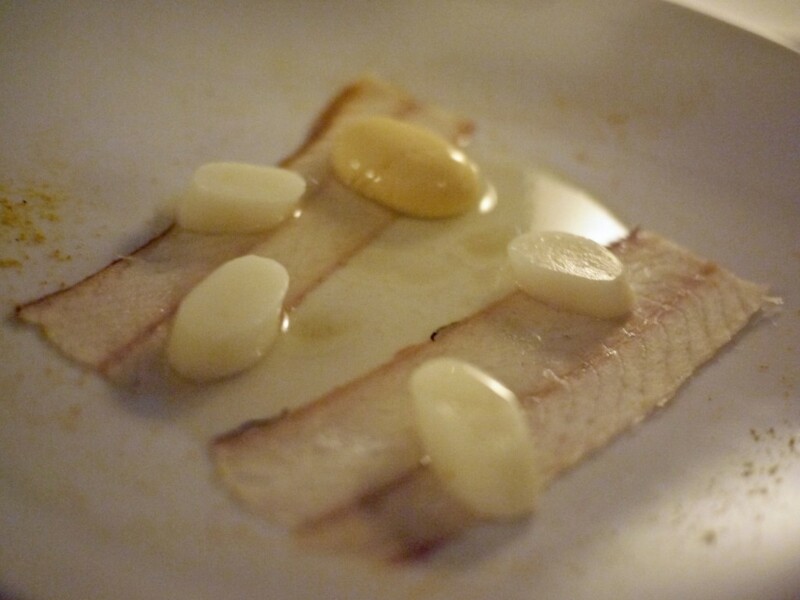 The combination of the white soy and cod stock “fish milk”, hapuka (or bass grouper) and potato paper was almost like a modern take on fish pie but I found there were too many flavours on the dish and distracted from the star ingredient of the show, the fish (though some may argue it was the fish milk). 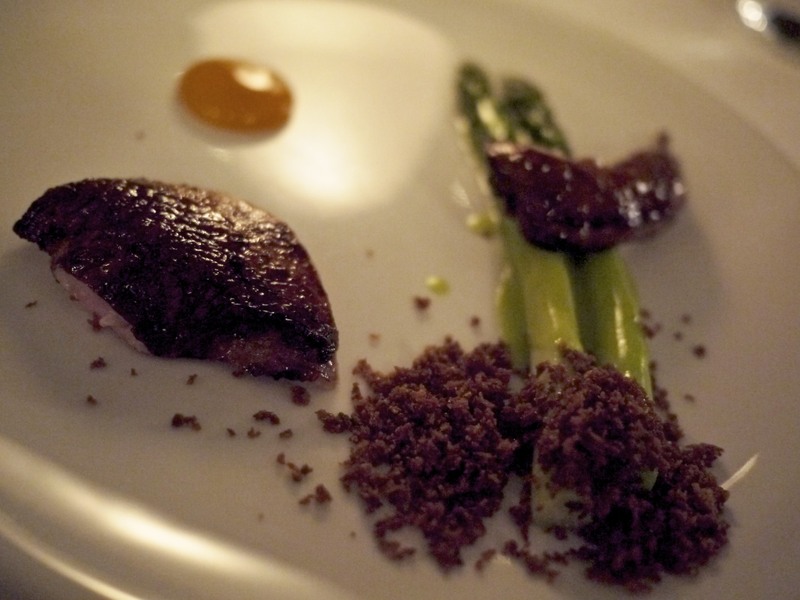 Redgate Farm quail with asparagus, egg yolk jam & rye. Again, a very well executed dish but nothing spectacular. The best bit for me was the asparagus that still had a lovely bite, together with the egg yolk jam and crunchy rye flakes. Thus concluded the savoury segment of the meal. The first dessert of the evening was a strange one. 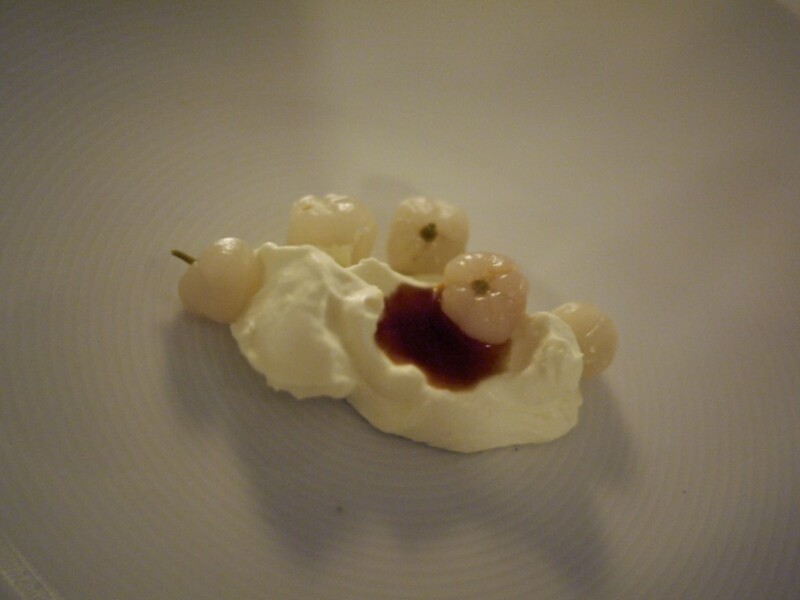 The Lemon aspen with cultured cream & whey caramel was a good attempt at utilising some native bushtucker into the meal. I enjoyed the combination of the incredibly tropical citrus flavour against the sweet caramel and thick whey. However, I found the additional spicy character of the lemon aspen to be odd for this dish. 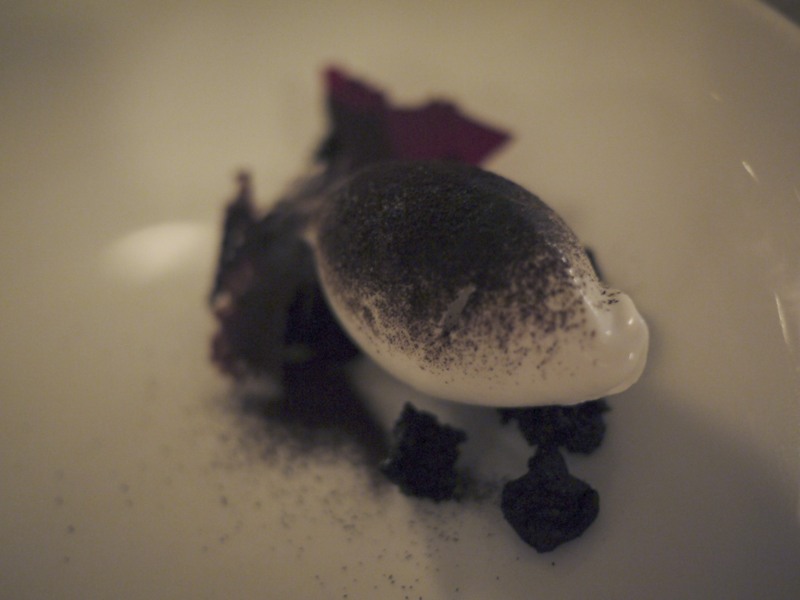 The penultimate desert course of Coconut, liquorice & beetroot was not personally my cup of tea, primarily because I found the liquorice flavour dominating the palate and I could hardly taste the coconut sorbet. 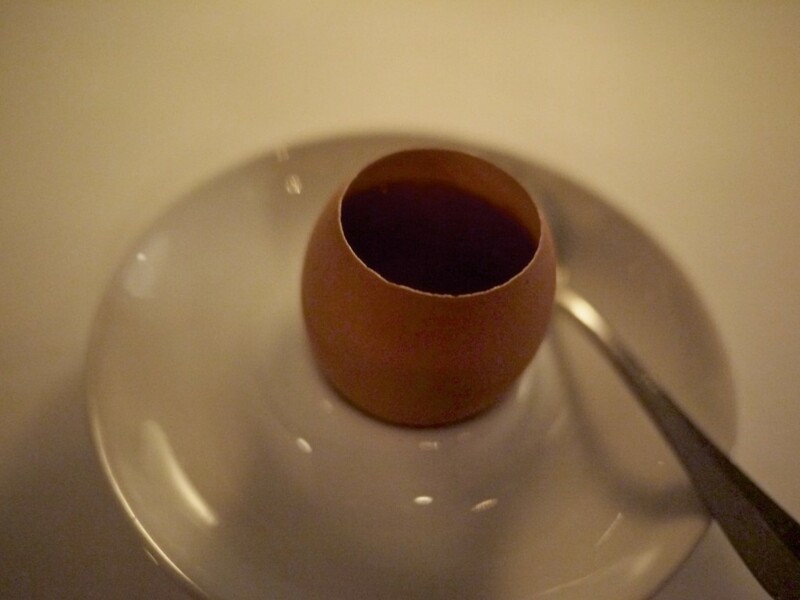 The finale was another signature dish of the Sauternes custard with a layer of caramel on top. The bitter layer of caramel on top worked very well against the sweet tone of sauternes from the underlying custard. It was a very clever, though some would say perhaps sacrilegious, way to use a lovely drop of wine to make this. There’s no doubt that the rare moments of sheer brilliance like the finale reflected the glorious past of Marque. But against the backdrop of these creative dishes, it was apparent to me from my meal that evening that Best had run out of ideas, or perhaps inspiration. For a man that had been running at the forefront of contemporary cuisine in Australia, I must admit that the one thing I expected was innovation or at least novelty but sadly that was nowhere to be found. This entry was posted in Australia and tagged Australia, Mark Best, Marque, Sauternes Custard, Sydney on March 2, 2014 by admin.